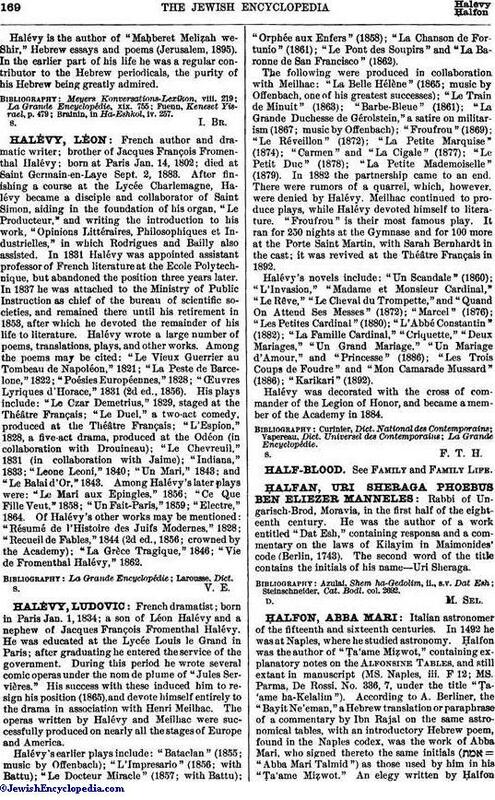 French dramatist; born in Paris Jan. 1, 1834; a son of Léon Halévy and a nephew of Jacques François Fromenthal Halévy. He was educated at the Lycéc Louis le Grand in Paris; after graduating he entered the service of the government. During this period he wrote several comic operas under the nom de plume of "Jules Servières." His success with these induced him to resign his position (1865), and devote himself entirely to the drama in association with Henri Meilhac. The operas written by Halévy and Meilhac were successfully produced on nearly all the stages of Europe and America. Halévy's earlier plays include: "Bataclan" (1855; music by Offenbach); "L'Impresario" (1856; with Battu); "Le Docteur Miracle" (1857; with Battu); "Orphée aux Enfers" (1858); "La Chanson de Fortunio" (1861); "Le Pont des Soupirs" and "La Baronne de San Francisco" (1862). The following were produced in collaboration with Meilhac: "La Belle Hélène" (1865; music by Offenbach, one of his greatest successes); "Le Train de Minuit" (1863); "Barbe-Bleue" (1861); "La Grande Duchesse de Gérolstein," a satire on militarism (1867; music by Offenbach); "Froufrou" (1869); "Le Réveillon" (1872); "La Petite Marquise" (1874); "Carmen" and "La Cigale" (1877); "Le Petit Duc" (1878); "La Petite Mademoiselle" (1879). In 1882 the partnership came to an end. There were rumors of a quarrel, which, however, were denied by Halévy. Meilhac continued to produce plays, while Halévy devoted himself to literature. "Froufrou" is their most famous play. It ran for 250 nights at the Gymnase and for 100 more at the Porte Saint Martin, with Sarah Bernhardt in the cast; it was revived at the Théâtre Français in 1892. Halévy's novels include: "Un Scandale" (1860); "L'Invasion," "Madame et Monsieur Cardinal," "Le Rêve," "Le Cheval du Trompette," and "Quand On Attend Ses Messes" (1872); "Marcel" (1876); "Les Petites Cardinal" (1880); "L'Abbé Constantin" (1882); "La Famille Cardinal," "Criquette," "Deux Mariages," "Un Grand Mariage," "Un Mariage d'Amour," and "Princesse" (1886); "Les Trois Coups de Foudre" and "Mon Camarade Mussard" (1886); "Karikari" (1892). Halévy was decorated with the cross of commander of the Legion of Honor, and became a member of the Academy in 1884.